A personal favourite that has never disappointed!! This is an eggless cake but in no way does this compromise on the quality of the cake. 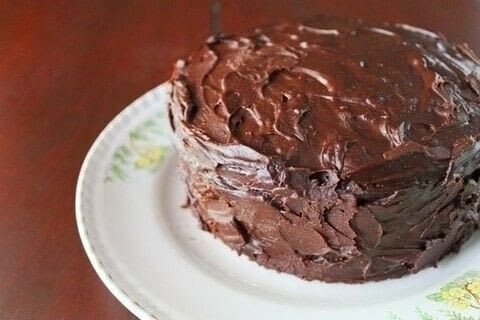 This cake is beautifully moist and when paired with this luscious fudge frosting, it is a winner!! It is extremely popular at my home and try it once and soon it will be popular at your home too!! Pre-heat the oven to 180 deg c. Line one large 9-inch spring-form pan or two 9-inch round cake tins. I prefer using 2 separate pans. For half the quantity of this recipe, use smaller tins. In one large bowl, combine all the dry ingredients - flour, sugar, cocoa, baking soda and salt, with a hand whisk. In another bowl, whisk together all the wet ingredients - 2 cups hot water, vegetable oil, vinegar and vanilla extract. Pour the wet ingredients into the dry ingredients and with a hand whisk, combine the two set of ingredients. Do not use a hand-mixer for this, a simple whisk will do the job. A few lumps are OK. Carefully pour the batter into the prepared cake tins and bake immediately for 40-50 minutes or until an inserted skewer comes out clean. Remove from the oven and transfer the cake to a wire rack. When it cools a bit, remove the sides of the tin and leave to cool completely and get on with making the frosting. Put the demerara sugar, butter and 125 ml water in a saucepan on low heat until the butter is completely melted. Once bubbling, take the saucepan off the heat and add the chopped dark chocolate. The heat from the mixture will be enough to melt the chocolate. Do not stir the mixture with a spoon but rather swirl the pan around to help the chocolate melt. Once melted, whisk the mixture until smooth and glossy. At this stage, it will be very liquid. Leave the mixture for about an hour. It will thicken as it cools down. This suits us just fine as the cakes have to cool completely before we use this frosting. If you've baked one layer, then cut the cake into two layers. Take a third of the frosting and sandwich it between the two layers. Spread the remaining frosting over the top and the sides of the cake in a manner of your choosing. Tip:If you've baked your cake in two layers, then let the cake that you put on top be placed upside down, as that gives the top a flat look.